The Alexandrite Laser emits focused light energy via an alexandrite crystal. As the light passes through the alexandrite crystal, a beam of light 755 nm long is produced. This light selectively targets pigmented areas with light, causing them to break up and fade away. Before | After: One session of Alexandrite Laser to address pigmentation. 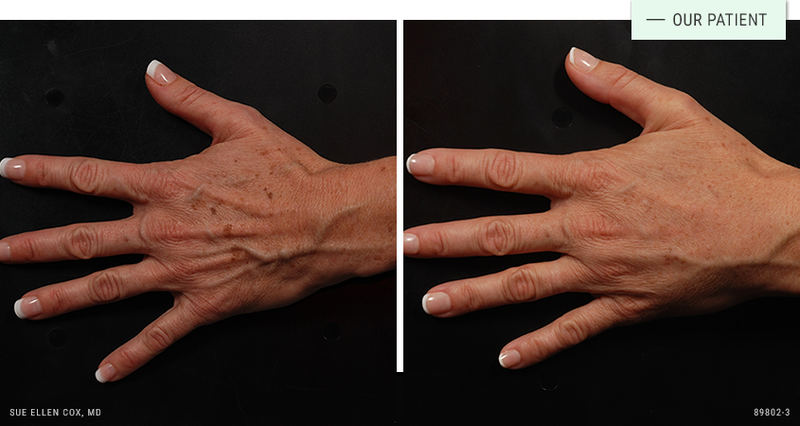 Before | After: Dr. Cox used a combination of filler and Alex Laser to give this patient a more youthful appearance on the hands. 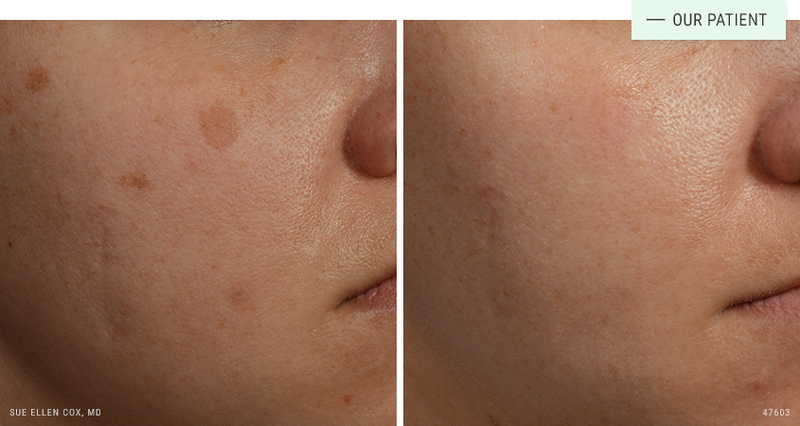 Before | After: This patient received one session of the Alex Laser to brown, pigmented spots on her cheeks. 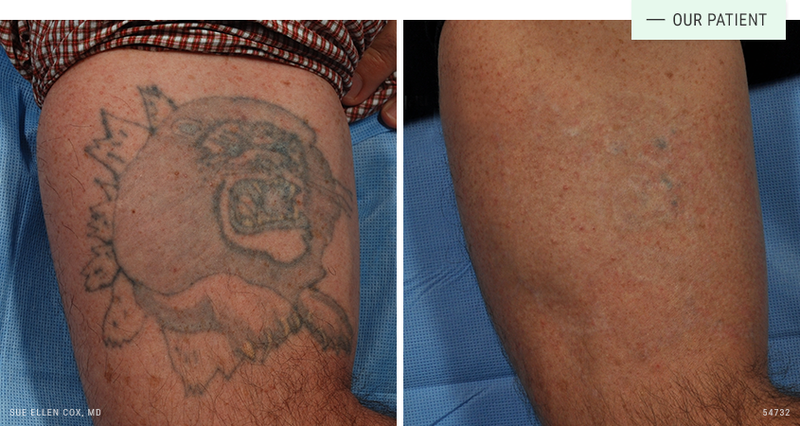 Before | After: A series of Alex Laser treatments effectively removes black, blue, red, yellow and green tattoo ink. 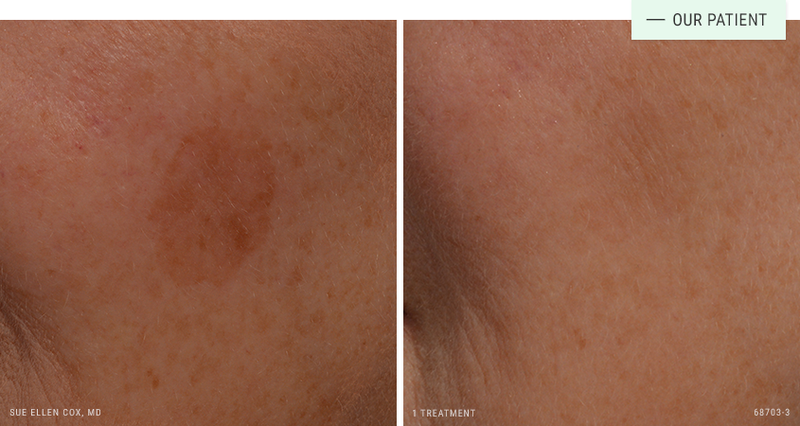 Before | After: The Alex Laser can be used to remove brown spots, age spots or sun spots on most areas of the body. The FDA has cleared the Alexandrite Laser to safely treat a number of issues related to skin tone and pigmentation. It has an excellent safety profile. Like any surgical or non-surgical procedure, there are risks. As a teacher and trainer of other physicians in laser procedures, Dr. Cox stresses the importance of finding an experienced physician who understands the finer points of laser treatment. Alexandrite Laser treatment is well tolerated. The procedure itself typically takes less than 15 minutes. Patients report a sensation of pinpoint heat and may feel similar to a sunburn for up to 30 minutes post-procedure. There is no real downtime associated with Alexandrite Laser treatment. The treated areas will take on a “baked potato” and may be sensitive for up to a week as it heals. In order to avoid unintended scarring, it is essential not to pick at scabbing or wash the area too vigorously. During this time, it is important to protect the area from sun exposure or other irritation. The Alexandrite laser reduces the appearance of brown spots from sun damage, and is effective for removal of tattoos composed of black, blue, red, yellow and green pigment. Many patients are happy with one to two Alexandrite laser treatment for smaller brown spots. Larger pigmented areas may require a series of treatment. 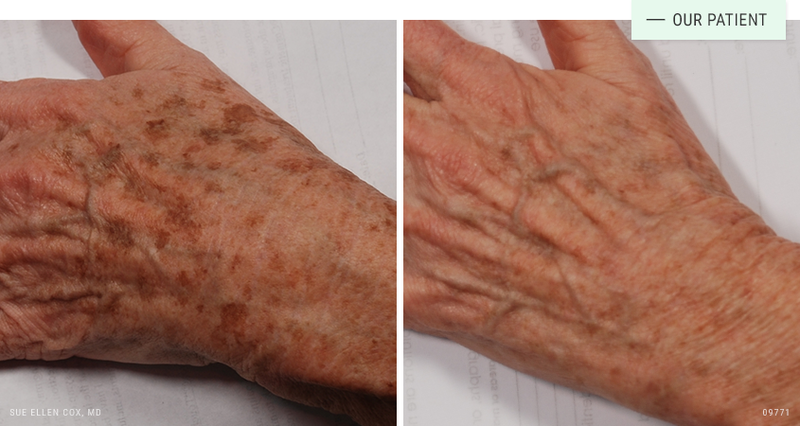 Once treated and healed, these spots typically do not return, although new ones may form. Tattoo treatment varies by tattoo size, age, color, type and depth of pigment. Once removed, the results are permanent. A series of treatments is required to produce results.